Like most avid readers I have a queue of books I’m reading and plan to read. When a new book gets added to the queue it gets bumped to the top either by plaintive recommendation or because I will see the person who gifted me that book soon, and I’ll want to share my thoughts about it with them. 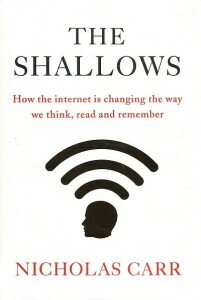 It was the latter that finally forced me to bump The Shallows: What the Internet is Doing to Our Brains to the top of my pile, to be read before a visit stateside to see my parents who gave me the book when I last saw them, in late 2014. The title of that article can be off-putting to those steeped in the digital universe, like myself. Surely this is some Luddite ranting, one might think at first. But on second glance … 200 pages of ranting? Unlikely. It might be because I conducted the vast majority of my schooling and created many of my learning habits before the internet began to play a role in that schooling and learning that this topic holds such interest for me. Indeed, it is only because of a long interruption of my undergraduate education that I even know what “the kids these days” are doing with online classes, JSTOR, and the like. Having graduated from high school in 1997 but having received my BA in 2009 and my MBA in 2011 means I’m happy to ask the question that undergirds the book: does the internet improve our minds? Much of me wants to, in the mode of Google’s anticipatory search function, interrupt the asker with an unqualified “yes” but the intellectual in me has to ask for more evidence. In the earliest chapters of the book Carr takes pains to not only parse the observable differences between reading digital content and “hard copy,” but he also takes us into the fascinating world of neurology, discussing how our brain constantly reorganizes itself to serve us better, no matter what format we use to learn or acquire information. By discussing the transition from the heights of oral culture which we saw in the Greeks, to the even loftier heights that the written word delivered through the flowering of Western Civilization, powered by Christianity and its enchanted universe, Carr gives his first caution: you don’t get something for nothing — and there is an observable change in brain structure and chemistry when memorization is no longer required. Yes and No. Yes, digitization often means (and this is confirmable through peer-reviewed studies) that we often read less attentively, with less comprehension, and less deeply in our digital lives. Add to that all the brain power expended to capture and process all the inputs coming in across social media channels and hyperlinks, and you have a new vast ocean of information … that is necessarily much shallower than your previous personal lake of knowledge and its own peculiar flora and fauna. I’ve seen this play out both among my peers and my students. My students articulate something unknown in my instagramless youth: FOMO (fear of missing out). They are subject to so many inputs and constantly fear that they may indeed miss something important. My peers feel obliged to keep up with the endless email and social media waterfalls. Perhaps, digital ignorance could be bliss? Rather than simply lament these changes, which have only accelerated since the publishing of this book, I prefer to offer you some opportunities to push back and recolonize parts of your brain. I discovered, to my own surprise, that I’ve been doing some of these things simply from long-held preference or habit — but that these were helping me maintain a deeper level of cognition and reflection. Write letters by hand. I never really bought into email correspondence. Instant delivery not only meant you never had to wait to receive the letter, but you also had an expectation of a speedy reply. Ask one or two friends that you don’t speak to on a daily or weekly basis to take up a old-fashioned, written correspondence with you. Not only will it be rather fun, but you will marvel at how differently you think and write with ink and paper than with keyboard and cursor. Write before you type. I almost always compose emails on the computer. Carr quotes T.S. Eliot, “the typewriter makes for lucidity, but I am not sure it encourages subtlety.” But for many other types of my writing, I write in a paper journal first, and then transcribe and edit that writing digitally. Writing in a notebook means I can write anywhere without having to lug around a digital device (and its necessary electrical appendages). Do not fully adopt a kindle. I finally gave in and bought myself one last year as a remedy for my luggage restrictions on short-hop travel here in Europe. I put a restriction on it, though. I would only use the kindle for “fun” reading like spy stories and detective novels, or classics I’d already read at least once. I’m an underliner and annotator, so my books become valuable to me for the notes and reflections I pen in them. No longer simply a map that can be used by anyone, my paper books become my personalized maps, and allow me to find important passages quickly, and better, when I go back to read a book a second or third time, I can observe a time stamp which asks silently if I still agree with my notes and underlines. Be intentional and single-task. I think the tide is already turning on this advice, but for the unconvinced, Carr discusses the neurological “switching costs” for your brain inherent in changing between different activities in multi-tasking. And so, I batch “write,” or “make calls,” or “compose emails.” Rather than switching between activities frequently, I do a series of the same activity, one after the other. 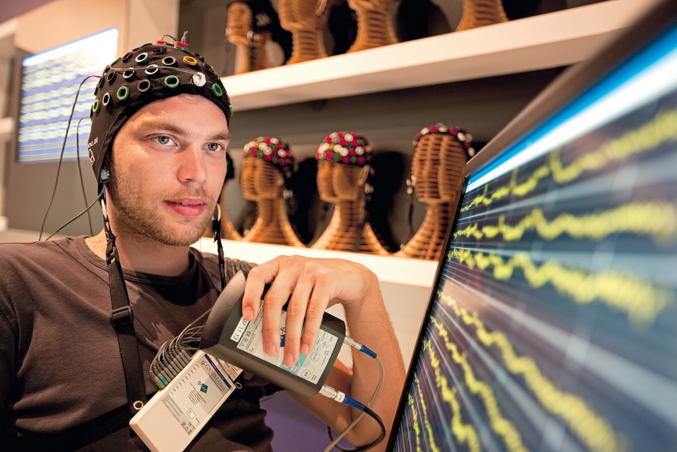 My brain stays in the same zone and my productivity is observably better. Do read Carr’s book. Though published in 2010 it is still timely and relevant in its observations about our digital lives and the big players in it. Stephen lives in Paris, where he writes and manages small businesses. He writes on culture, the permanent things, and all things French. You can also find his writing online at The Fleming Foundation, Chronicles, The American in Paris, True Restoration, and Medium. You can also chat with him on twitter or instagram: @stephenheiner. Stephen holds a BA in English Literature and minors in Catholic Studies and Business from Rockhurst University. He holds an MBA from Saint Louis University. He also served in the United States Marine Corps Reserve as a Nuclear Biological and Chemical Defense Specialist. The Shallows is indeed a very timely and relevant book. In many ways, Carr is this generation’s Neil Postman whose books, ‘Amusing Ourselves To Death’ and ‘Technopoly’ are still extremely helpful & relevant in navigating our times. Also recommended along these same lines is ‘The Googlization of Everything: And why We Should Worry’ by UVA’s Siva Vaidhyanathan. Thanks for that book recommendation!